Buying cookware has become a bit more complicated over the last 10 years. With access to a larger selection through the internet and big box retailers, consumers are now confronted with new term, technologies and approaches to cooking. Shown above (left to right), a Calphalon hard anodized cookware set, a Farberware stainless steel set, and a Le Creuset enameled steel set. 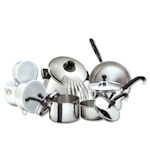 One of the most important factors in choosing cookware is the type of material used. Stainless Steel - Stainless is easier to maintain than aluminum or copper; it doesn’t require scouring or polishing. Stainless steel doesn’t rust, however it is a poor conductor of heat. To prevent hot spots when heated over a flame burner, usually disks of copper or aluminum are added to the bottom of smaller pans. The thicker the disk the better the distribution of heat. Look for at least a 3mm thick aluminum disk or 1mm thick copper disk (copper is a better conductor). Larger pots which are used for boiling fluids don’t require even distribution of heat and usually will not have disk. Tri-metal layer pots use layers of stainless, aluminum and stainless for heat distribution. However, the thickness of aluminum is limited by the manufacturing process, resulting in the possibility of hot spots. Non-stick uses a special process to create a rough surface on the stainless for the non-stick coating to adhere to. These have the aesthetics of stainless with the convenience of non-stick cooking. Stainless steel cookware comes in three types, 18/0, 18/8, and 18/10. The second number denotes the nickel content, and generally the higher the nickel content, the better the quality. Plain Aluminum - Aluminum is a good conductor of heat (second in cookware to copper). But can scratch and interact with food. With aluminum cookware, thickness is the key to quality. The thicker the pan, the more even heat will be distributed and the less likely it is the pan will warp under repeated heating and cooling. At one point, there was a concern that Aluminum cooking pans were linked to Alzheimer’s disease. Recent studies by the FDA have shown that there is no connection. Hard Anodized Aluminum - Is aluminum that has undergone a special treatment. The result is a harder and non-porous surface that heats up quicker and more evenly. Hard anodized surfaces are twice as hard as stainless steel. However, they can be discolored by dishwasher detergents, so most manufacturers recommend hand washing. The surface is not a non-stick surface, so that oils will be needed to prevent food from sticking. Copper - Copper is the choice of many professional cooks because it is a very good heat conductor; it heats up quickly and evenly. But copper cookware is expensive and needs polishing. To prevent the copper from interacting with foods, copper pans should be lined with tin or stainless steel. Copper pans should never be put in the dishwasher or left to air dry. Glass - Is a poor conductor of heat, this results in hot spots. For this reason, glass is mostly reserved to casserole dishes and cookware lids. Cast Iron - Is very heavy and a poor conductor of heat. Cast Iron retains and evenly disburses heat. Cast iron will interact with food unless it is “seasoned” by rubbing shortening into the cooking surfaces of a clean pan, then baking for 2 ½ hours. Alternatively, enamel coated cast iron does not interact with food and requires no seasoning. Even heating -Chose the cookware material, thickness and construction to ensure even heating where it is required (see above). Clean up - Check with the manufacturer instructions to see if a pot or pan is dishwasher safe. Handle safety - Handles come in metal, plastic, wood and glass. Metal may get hot on the range top, however it is the most durable. Plastic and wood keep cooler over burners, but can only go from stovetop to oven with low temperatures. Glass handles are molded as part of the cookware and typically stay cooler over burners. Rivets - the most durable connection, but may be difficult to clean around rivets. Welding - the handle is welded to the outside of the pan. This keeps the inside of the pan smooth, but is not as durable as a rivet. Screw On - many plastic handles are screwed on to welded on studs. This is the least durable method. Handle comfort - Look for a pot / pan that feels comfortable and balanced. 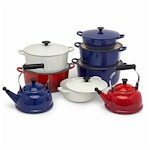 Warrantee - many brands of cookware come with lifetime warrantees. Coatings - non-stick allows for easy clean up and can permit healthier cooking with the use of less oil. Determine your cooking values. If you care more about convenience and appearance, consider a matched set of cookware. If you care more about the quality of the cooking process, consider mixing cookware pieces and metals, i.e. 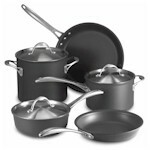 : cast iron skillets, copper sauce and sauté pans, stainless steel stock pots and aluminum / anodized aluminum frying pans. Compare metals, coatings, handles, tops and warrantees across several brands.